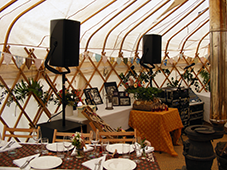 This 2.6kW system is designed for parties and fund-raising or other social events. It combines all the facilities and features of our Disco PA System with very high-fidelity reproduction at high output levels, and even coverage of a large area. It is adequate for events with up to 1,000 guests. As with the standard Disco System, a range of supplementary DJ equipment is available, and input cables for other sound sources are included. From £300.00 + VAT (£360.00 including VAT) per day, including delivery1. Large marquees and outdoor events. Can be used with additional equipment for live music (e.g. function band and disco). These speakers are among the best 12″ full-range cabinets in the world. They can be placed to take full advantage of their audio quality using d&b's Z5352 flying brackets and Z5024 stand adaptors and a pair of K&M 21300 wind-up loudspeaker stands. The D12 combines an advanced fan-cooled high-power amplifier with comprehensive digital signal processing, ensuring that the E12s will deliver top quality audio all night without distortion. Powering the S15s, The PLX3102 is a modern switched-mode amplifier with fast transient response and high damping factor, making it an ideal partner for the Martin Audio bass loudspeakers. Combining deep and powerful bass with fast transient response. If they can be arrayed so that their outputs couple these loudspeakers will deliver a combined peak sound pressure of over 140 dB. The WZ3 12:2 is a professional small-frame mixer with 8 mono + 2 stereo channels. Its transparent preamplifiers ensure there is no loss of audio quality between sound source and loudspeaker. With 2 × 31-bands of sonic precision, this makes dealing with feedback or simply changing the overall tonal balance easy to do. These wireless microphone systems - with a choice of handset, headset or lapel microphone - combine clarity and intelligibility with high immunity to feedback and dropout. The Denon DN-C615 allows playback of both audio CDs and MP3 tracks from data-formatted discs, with multiple functions and options for a wide variety of applications. Delivery, set-up, take-down & collection are included without extra charge anywhere within a 15 mile radius of Stroud (an area that includes most of Cheltenham and Gloucester, as well as smaller towns like Cirencester and Tetbury). Extra delivery charges may apply over greater distances (see our prices page for details).